At this time of year, lots of people talk about resolutions. People talk of dieting and keeping fit, quitting smoking or drinking. I heard a statistic that 35% of us make a new years resolution and only 8% of them stick to it. That doesn't sound good, does it? I haven't made any resolutions, as such, but have made a renewed effort to spend more quality time with God each day and try to have more of an attitude of gratitude. In my devotion time I have felt God has shown me a picture of a door. 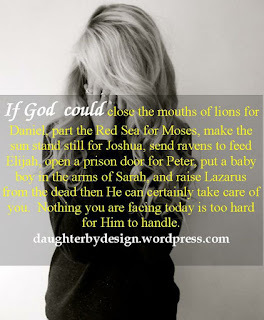 As I considered this, I began thinking about God opening and closing doors in our lives. It is a concept seen time and again in scriptures and also in my life. I believe there are times when God closes the door on situations in my life and has opened new doors for me with fresh opportunities. There have been times full of hurt, bad situations, dark times and God has closed the door to them. There have also been good times, enjoyable times that have become closed doors. But the doors that God has opened have always been better. "I have opened a door for you that no man can close." God can help you through any situation. He can close the door to the old and open doors to the new. Maybe today you feel that this is all very well and good all these doors opening and closing; but I feel like I am stood in the hallway waiting! I completely understand that. There are situations in my life that I am believing God will open a door to. I have been believing a long, long time, but, still I feel like I'm waiting. Waiting in the hallway for God to open the door so that I can step through into the promises he has for me. Will the door ever open? I don't know. I hope and pray so! But I heard this great quote and it is something I try to follow, even on the darkest days. I don't know where you are today, maybe you have stepped into a new door and are content, maybe God has shut the door on a difficult situation, maybe you wish he would. 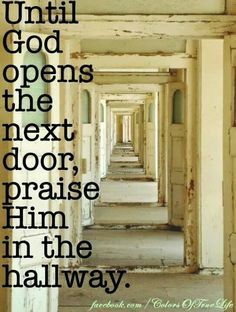 Maybe you feel too messed up, or the situation is too big for God to do anything, or maybe, like me, you are praising God in the hallway. Thank You for sharing this thought from your experience. Diolch i chi am rannu meddyliau o brofiad eich gweinidogaeth.